Celebrating the Page 2 Stage Vol.2 Book Launch! 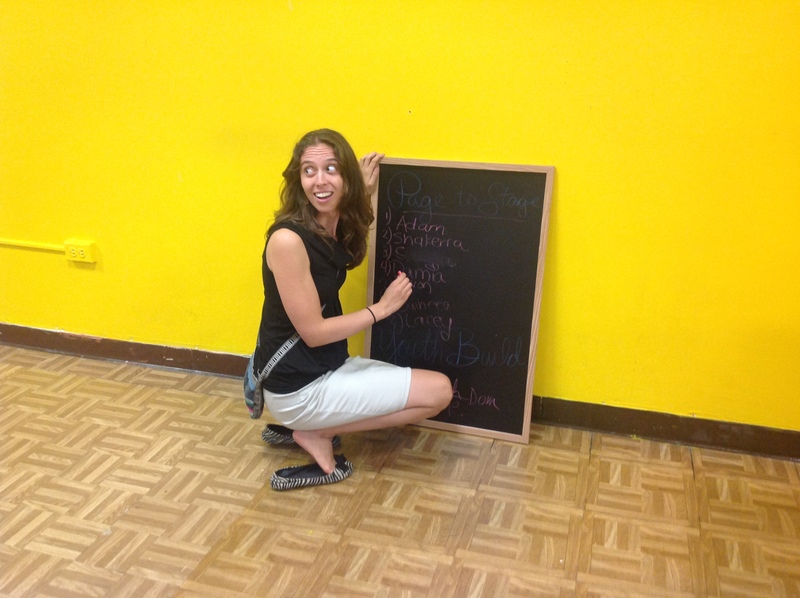 Yesterday was AmeriCorps Member and Community Project Coordinator Sara Graybeal’s last day at YouthBuild – and, she said, she couldn’t think of a more appropriate place to be than in the CCR (YB lingo lesson: that’s the Community Celebration Room) with students and alumni who have participated in the slam poetry group Page 2 Stage. 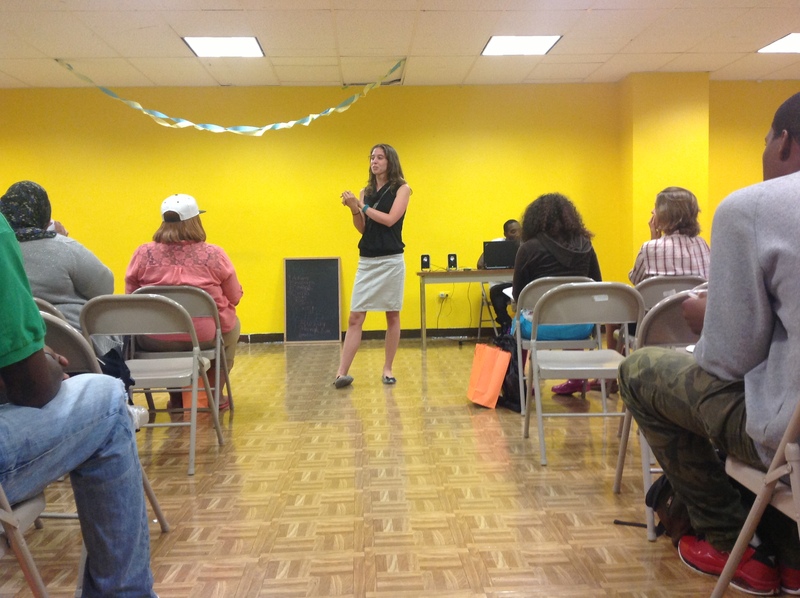 Sara founded Page 2 Stage as an after-school activity nearly two years ago, when the Class of 2012 was just settling in at YouthBuild. Students in the group participated in writing and other creative exercises, rehearsed their pieces, and regularly attended events hosted by the Philadelphia Youth Poetry Movement and other spoken-word groups in the city. In just a few months the group grew from five to twenty students, who met regularly during the week and also on weekends for workshops and literary events. When some students moved to Lancaster, PA for the summer to attend the Thaddeus Stevens College summer bridge program, Sara took the train to visit them and hold workshops. At the end of the 2011-2012 school year the group published a chapbook of poems through 2 Pens & Lint, a local press that emphasizes the change-making power of art. The group was so popular with students that in the following academic year it became an elective in YouthBuild’s academic curriculum, as well as an after-school activity. Sara signed up for a second year as a YouthBuild AmeriCorps member, and in her second year applied for and was awarded a Bob Costas Grant for the Teaching of Writing, which she used to pay for workshops for students and to fund the publication of a second chapbook. Which brings us back to yesterday. The new volume hot off the presses, Sara put together a book launch and poetry reading that alumni, students, staff, friends and family attended. Guests enjoyed food, cake, and music deejayed by student Larry. Students cheered and snapped their fingers for their classmates as they read from the publication. Some staff shared their own original work, too! The poems were diverse in tone and subject – personal, political, outraged, loving, clever, uplifting – but all were heartfelt and honest. We applaud our students for their bravery and creativity, and thank them for sharing their work with those of us lucky enough to attend. We also want to thank Sara for bringing Page 2 Stage to life and helping it grow over the past two years. She is an exceptional teacher and will be missed, but we are optimistic that slam poetry and creative writing will live on at YouthBuild in the years to come – so stay tuned! 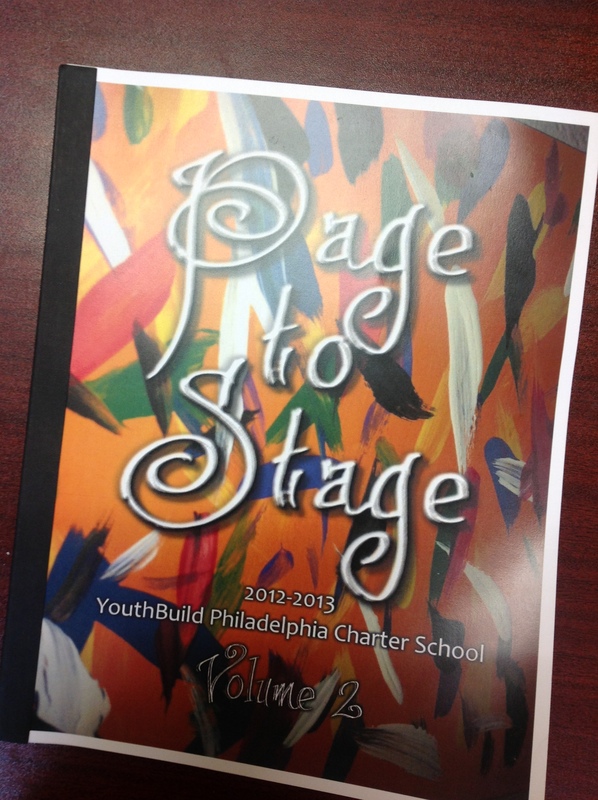 If you would like to purchase a $5 copy of the Page 2 Stage Vol. 2 chapbook, it is available on the 2 Pens and Lint website! Proceeds benefit YouthBuild Philly.